This is a well conceived idea with excellent documentation. The end result would ease user frustration and lessen errors. UI UX is what developers strive for and this idea adds value to that. +1 I second this especial for the file tree address bar as well, because it blends in so much with the top pane header that I kinda instinctively overlook it and forget about navigating the explorer that way, it would be nice if we could colorize ROOT > ETC to a different color than just plain faded out white. The minimum of 1 and max of 7 had been thought up because to protect the Three-dots overflow menu from being over filled. The mechanism would then work in a cycle order. So for example: if 'share' and 'Properties' were both added to the toolbar then that would mean these two would no longer appear on the three-dots menu unless they were removed from the toolbar during customization of toolbar. This keeps things logical. 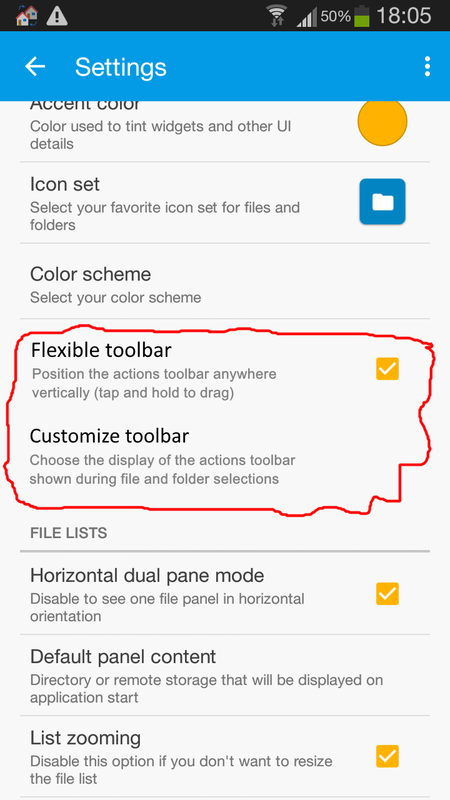 Summary: So maximum 7 icons but minimum of 1 icon for the toolbar. maybe so that one will not work without the other enabled first within the Settings. Additionally some nice Drag and drop animation ehile dragging. Just ideas that coke to me.